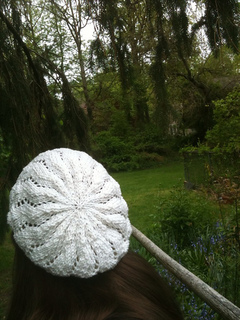 The Lace Ribbon Slouch Hat is a summery slouch that can be knit in a day! 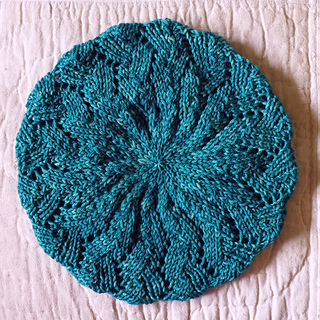 Featuring a garter-stitch brim and an addictive, yet simple lace motif, the hat is a pleasure to knit and to wear. 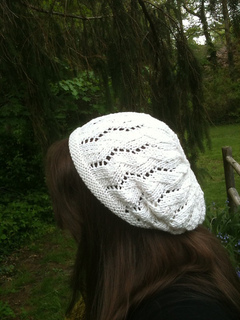 This lightweight summer slouch is made in a cotton or cotton blend yarn that lends drape and definition, and was inspired by the Lace Ribbon Scarf and a winter hat made by sweetgeorgia. I’ve received a few questions on how to make the YO holes larger. Hopefully the following helps! Depending on which way you wrap the yarn in the yarn overs (forward or backward), the lace makes either bigger or tighter holes when you knit into the yarn over on the next row. On the plain knit rows after a lace row, approaching a YO, you can either knit into the front of the stitch (like any other knit stitch) or the back loop. When YO-ing, if you wrap your yarn beneath the right needle and over: you can knit into the front loop on the next row, and it should make a bigger hole. When YO-ing, if you wrap your yarn over the back of the right needle, and then behind for the next stitch: you can knit into the back loop on the next row to make a bigger, more pronounced hole. Honestly, either one gets the same results, so I don’t think any one is more correct. Either way, both make holes! Knitting/purling into the front vs. the back of YO’s also changes when you’re knitting in the round, rather than back and forth on straight needles. The original hat’s brim was made with size US7 needles, and gives a looser feel. 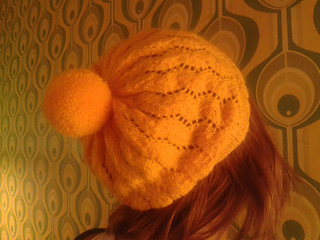 I’m recommending the brim with US6 needles for most head sizes, but if you have a larger head (or prefer a looser hat), you should think about going up a needle size.